Lady of the Orient is a gorgeous Indian themed slot machine, one of the more elegant designs that have come out of Microgaming’s labs. 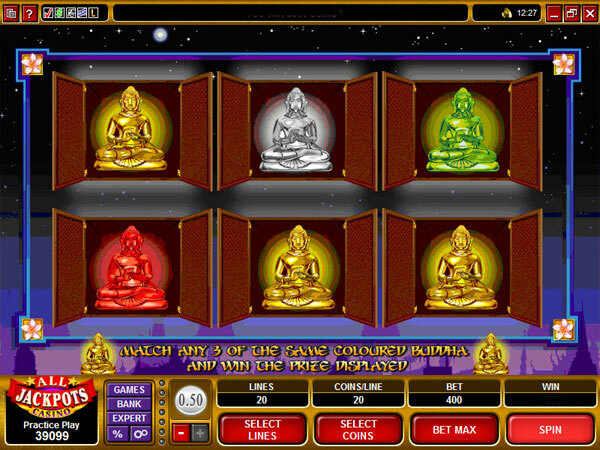 While the Chinese get a lot of attention from slot machine developers, the games that pay attention to the beauty of the Indian culture are far more rare. This is one of those slots, and it manages to make this country incredibly appealing. The oriental lady is only one of the aspects that is covered, the others being focused on the architecture of the country or on things like beautifully crafted bracelets. This is not only a beautiful game, but also one that has high payouts (up to $50,000) and plenty of features for you to take advantage of (bonus games, free spins, 3x multipliers, scatter symbols and a wild). It’s a 20 line game, with 5 reels. The features of this slot will give you a rather limited wild feature, along with a scatter symbol, free spins, 3x multipliers and a bonus game. First of all, we have the wild symbol, which gets to show up on three reels out of five, the three from the middle (2 to 4). Since it can’t form a combo with only three symbols, the wild doesn’t pay you anything extra. It doesn’t apply multipliers either when it manages to substitute for another symbol and it helps a new combo form, so that’s another opportunity missed. The Palace is the only symbol that can’t be replaced with a wild, the reason being that it’s a scatter feature. The Palace scatter is a more typical kind of feature, and without the limitations that are placed on the wild. It can appear on all the reels, and it will form its own type of combination, which doesn’t need symbols on predetermined paylines. In whatever random locations the scatters appear, they will award payouts of 2x to 100x the bet, as long as you have enough of them (two to five are needed). 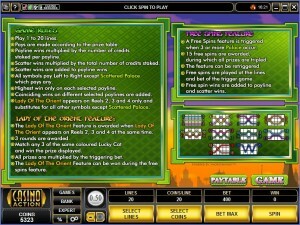 In order to start up the free spins, you need Palace scatters in place in at least three locations on the reels. 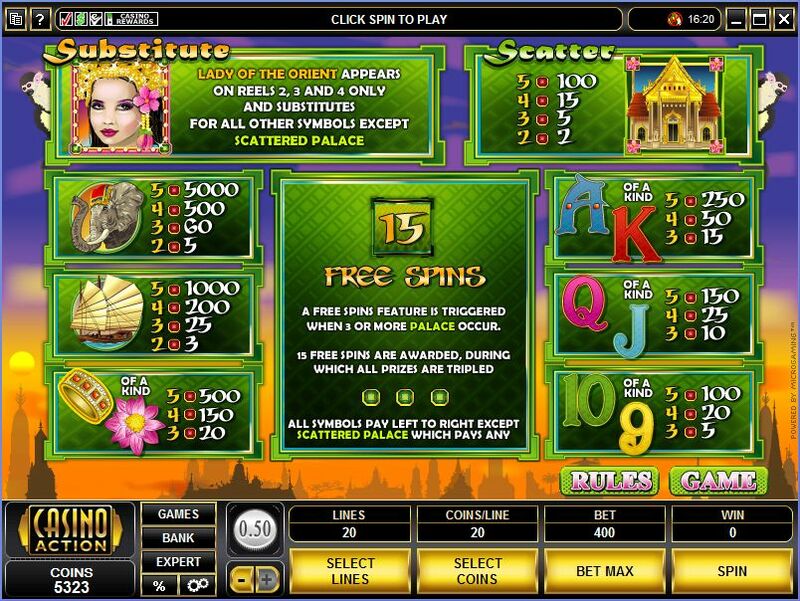 You get in exchange 15 spins for free, with tripled prizes (3x multipliers). You can also retrigger this feature with another set of 3+ Palace icons, just like it happens in most slots. The wild symbol is the one to trigger the bonus game in Lady of the Orient. 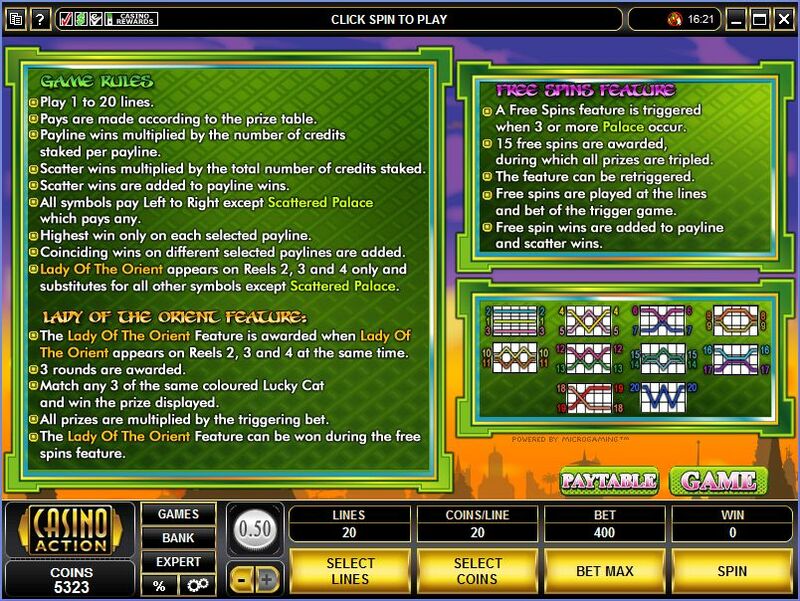 Whenever you have wild symbols on all three reels where they are allowed (2nd, 3rd and 4th), you get access to the bonus game. A total of three rounds of the feature are offered. During this feature, you are asked to match three symbols of the same color. Once you manage to get three matching symbols, you get the prize associated with them. 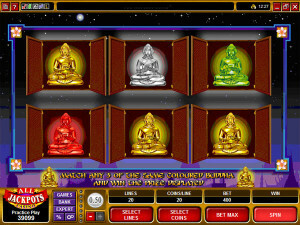 The game can be played both by high rollers and penny slot players. The lowest wagers can use only one coin per line, with values as small as $0.01. The higher wagers can use a maximum of 20 coins, with denominations reaching $0.50. The result is a bet of $10 per line, or $200 total, when everything is maxed out. The slot’s 5,000x top payout is not impressive, even though it means up to 100,000 coins, or $50,000. There are games out there that offer more bang for your buck. 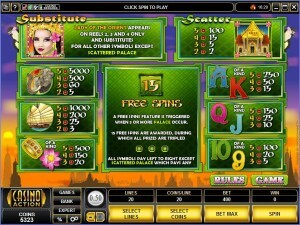 The Indian theme was very well handled, resulting in one of the prettier slots that I’ve seen released by Microgaming. While they have a lot of great designs in their portfolio, there aren’t that many that I could use the word “delicate” when describing them, and that’s exactly what this game looks like. There is a lot of light green in it, eggshell yellows and images of Indian cities, palaces, jewelry and the beautiful lady that is mentioned in the title. Symbols: Lady (wild), Palace (scatter, 100x the bet), Elephant (5,000x), Sail Ship (1,000x), Buddha (500x), Ring (500x), Ace (250x), King (250x), Queen (150x), Jack (150x), Ten (100x) and Nine (100x). There are a lot of things that the developers got right, and which recommend this game. The design and the features would be my favorites, with the prizes being more on the average side. 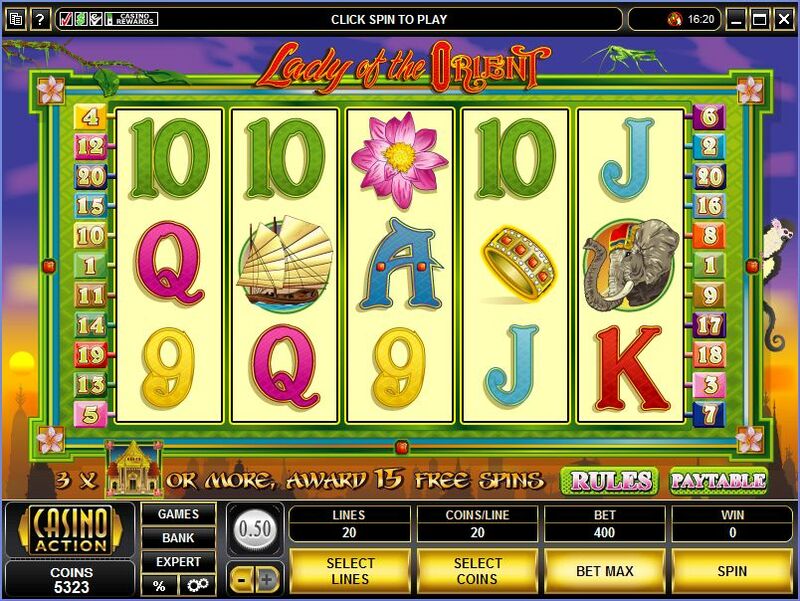 You will find Lady of the Orient at any online casino which chooses to use software from Microgaming, playable either for free or for real money.